I opted to do the ALS Ice Bucket Challenge and add in a Twist of Lyme. I did this because I suspect that, in at least some cases, that many autoimmune diseases (such as ALS, MS, Rheumatoid Arthritis, etc.) may be caused by the Lyme bacteria. Currently, Lyme research is underfunded. This NEEDS to change. There are so many unanswered questions when it comes to chronic Lyme. We need a formal research group at a major university investigating Lyme. I believe that Dr. John Aucott at LymeMD is best positioned to make this happen. There are so many great organizations that focus on Lyme awareness and I am grateful for the very important work they do. They have paved the way for us Lymies to be recognized and I am grateful but we need to fund research now. My neice, Ashley braved the cold and so did her brother David. My friends Sarah and Nicole also joined in on the movement! I pray that the momentum continues to grow. 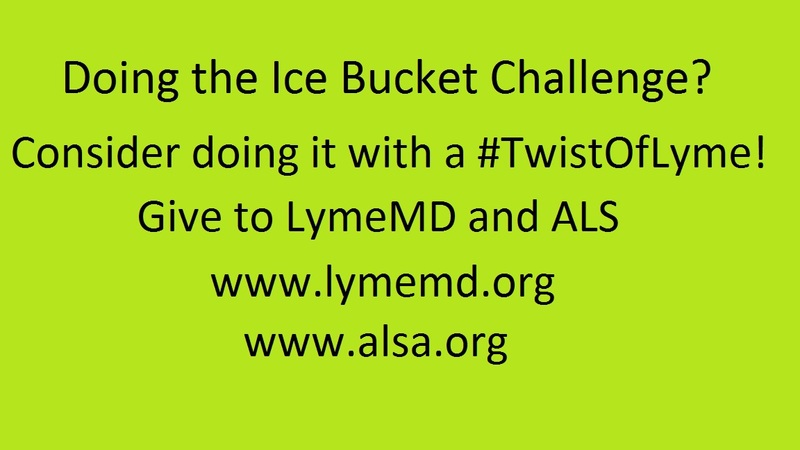 If you are doing the ice bucket challenge, please consider adding in a twist of Lyme! Even just mentioning us helps build momentum and visibility. My dear friend Ellie also accepted the challenge. What we really need is more Lymies to share their stories and explain why we need formal research into this very enigmatic disease. I know taking the ice bucket challenge is hard but this is an amazing opportunity to gain visibility and hopefully raise much need funds for Lyme research. Please consider rising to the task and sharing your story publically. Additionally, I found an entire website that claims there is a link between ALS and Lyme. Study: 9 in 10 ALS Patients infected with Lyme bacteria. However, I am not a scientist and cannot verify the degree of their scientific methodology. Caveat lector. Thank you for taking the time to read this and hopefully you will share it widely! Bless you ALL!